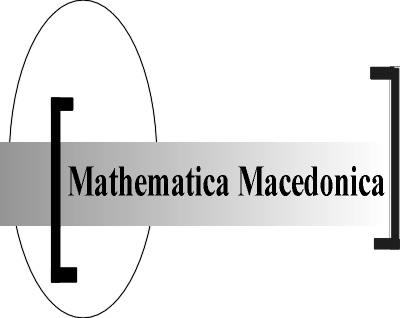 Mathematica Macedonica (Math. Maced.) publishes original papers in all areas of mathematics since 2003. Math. Maced. will also publish invited survey articles, short notes with interesting results or open problems. The journal receives only papers that have not been previously published and are not sent for publication elsewhere. It is published once a year. Because the journal is with open access, the published articles are available on the site. Manuscripts written in English should be sent to the Editor in Chief or editorial secretarie, by e-mail (preferable, PDF is strongly encouraged), or by regular mail. If sending by regular mail, three clearly legible copies are required. Authors should also send any of their unpublished papers to which crucial reference is made in the manuscript. The submitted paper must not be previously published in, nor have been submitted to another journal. Papers should be typewritten in any version of LaTex (preferably) or WORD, (not exceeding 20 pages). The first page should contain the article title, author's and coauthor'(s) name, affiliation, an abstract, a list of keywords and phrases and AMS Mathematics Subject Classification (2000). References should be listed in the alphabetical order at the end of the manuscript. The authors will joinly receive 20 offprints free of charge.